Designed for unrelenting power. 3-bearing system with Instant Anti-Reverse™, 6-pin centrifugal brake, coated levelwind, and advanced Carbon Matrix Drag. "This is the only reel that I have ever consistently used over the years. I have caught almost every species of fresh and saltwater fish on my C3's, and they all have performed flawlessly." "Well, first off, i did have one of my C3's handle break, but they all can't be great right?! But, as far as money, quality, durability and pretty much anything else you can think of, you cant beat it. They're amazing reels." "What can I say. 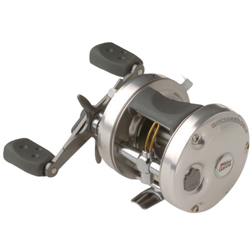 These reels are great! I own four C3s total, and of various vintages. The newest it 4 years old and the oldest is probably 20 years old. Never, ever had a problem with any of them." "I was a dyed in the wool spinning reel user until I bought my first Ambassador about 10 years ago. I have caught every type of salt and fresh water fish imaginable on this and have used it from the United Stated to Egypt and now in Indonesia."